This has been a LONG week. 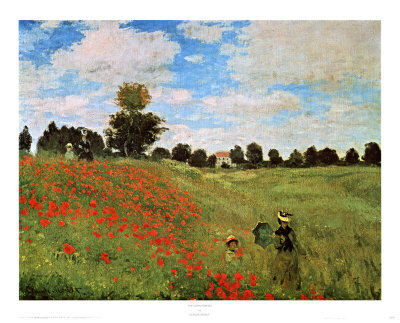 I’m such a party-pooper since cancelled my trip to Provence this weekend en famille for my mother-in-law’s (belle maman) 70th Birthday Party. 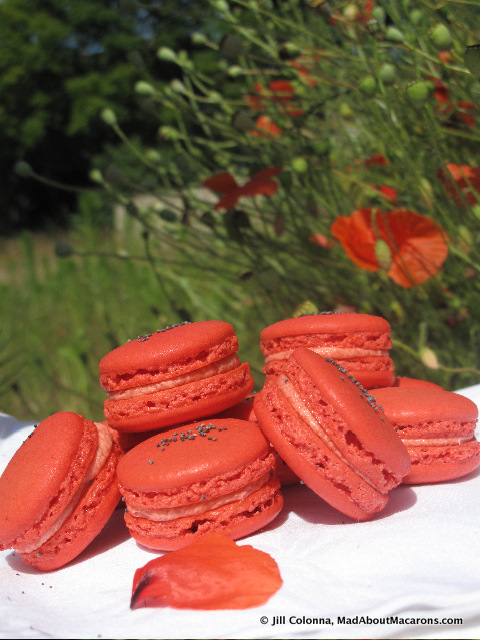 Just the thought of the TGV train and car trips back and forward is trop – too much. The back/sacrum has played up so much that, if I sit longer than 30 minutes a stretch, I turn into a chair – just like that! 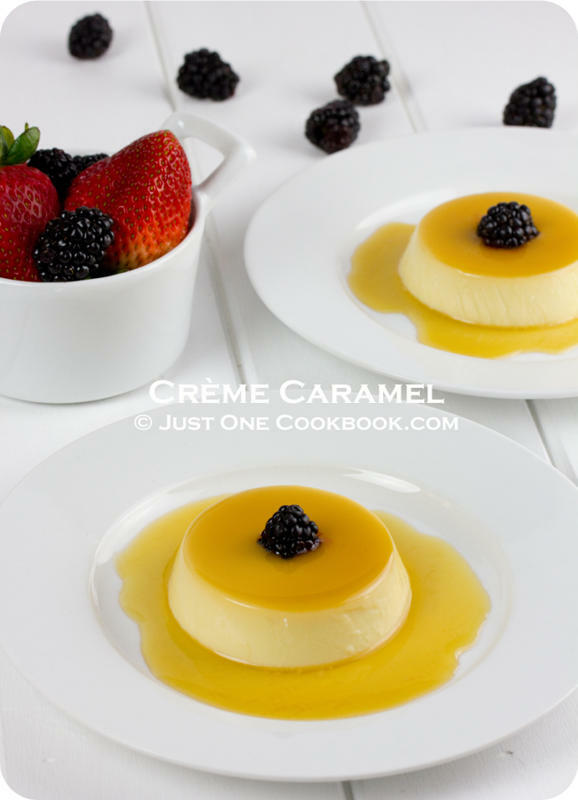 Just like that – my good friend, Nami (Namiko), author of her blog, Just One Cookbook, came to the rescue with the most perfect and best crème caramel recipe I’ve ever seen. 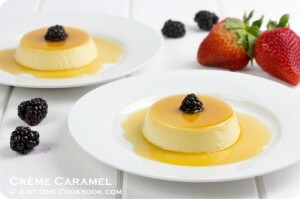 I should say Purin recipe, as Nami is Japanese and lives with her husband (who is her blog assistant – what a team!) and gorgeous children in San Francisco. For those of you who know Nami, I’m sure you will agree: she not only has an amazing blog with perfect Japanese recipes and stunning presentations, but she is also one of the most genuine and sincere people I know. When you receive a comment from Nami, you can’t help feeling the need to leap out the screen and hug her for offering such encouragement. I’m sure many of you know what I mean. Blogging is fun but it’s also time-consuming: often when you post something into the great empty void of the w-w-web, there is nothing that can beat an adorable comment to prove that someone has not only read it, but actually liked it! It’s what keeps the essential motivation going. Hello everyone! I’m Nami from Just One Cookbook. I was so thrilled and delighted when Jill asked me to be her guest blogger. 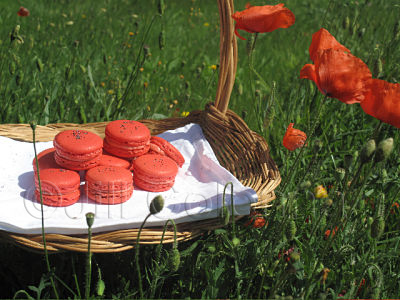 I am a big fan of Jill’s beautiful macarons and love visiting her website to see what new macaron recipe she’s come up with. Personally I don’t bake or make desserts too often but I definitely have a sweet tooth and I am also a recovering chocoholic. 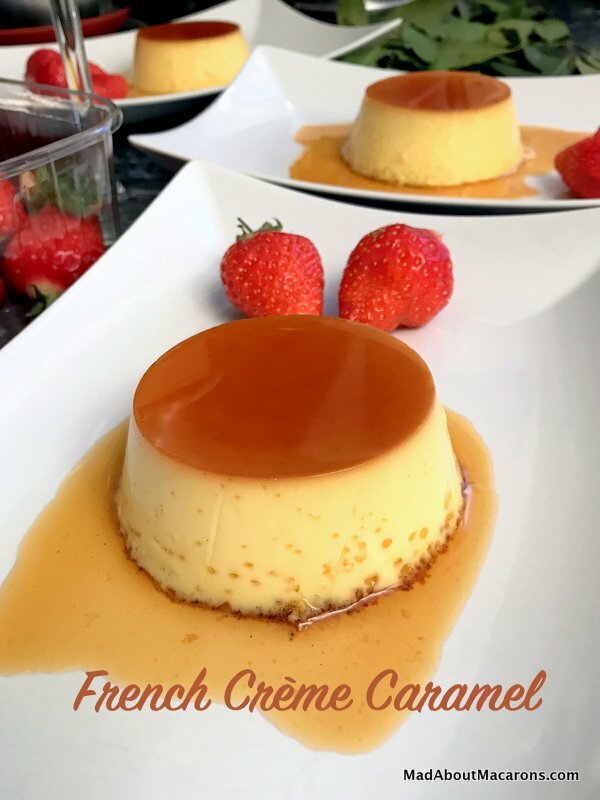 As part of the “using up your egg yolk” series, I want to share a recipe for Crème Caramel and as you might have guessed it does not require an oven. In Japan we call it Purin (it came from Pudding) and it’s definitely one of the most popular desserts. 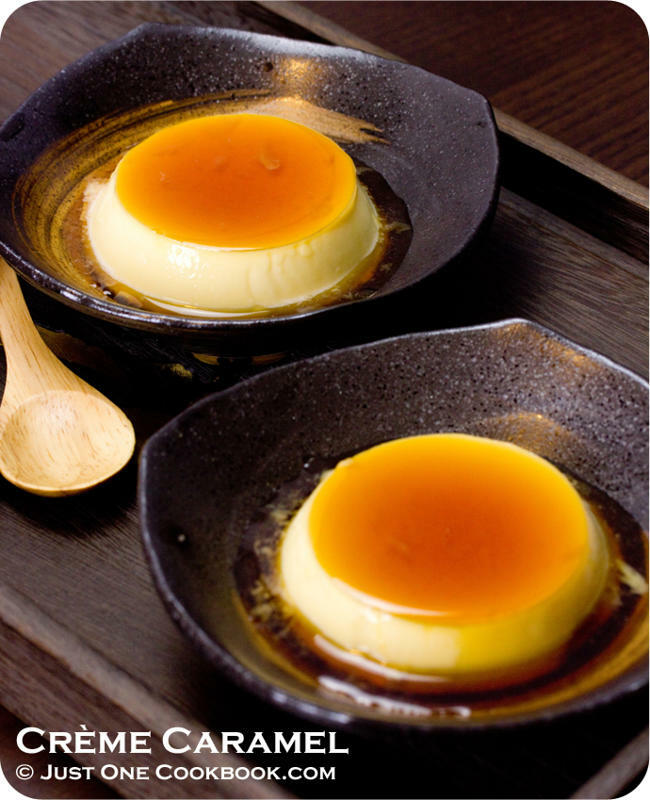 We can buy very good-quality Crème Caramel from neighborhood convenient stores or fancy pastry shops. My husband really loves Purin and today I’m sharing the recipe my husband said it’s the best ever. Thank you Jill for having me over. Cheers! * I also added measurement in US measuring cup in parentheses, but I highly recommend using a food scale to follow this recipe precisely. 1. 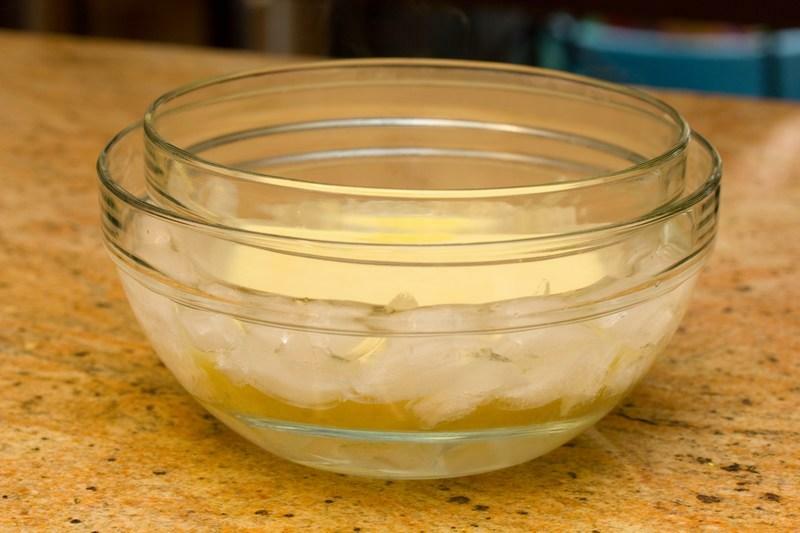 In a small bowl, combine gelatin and water and set aside. 2. 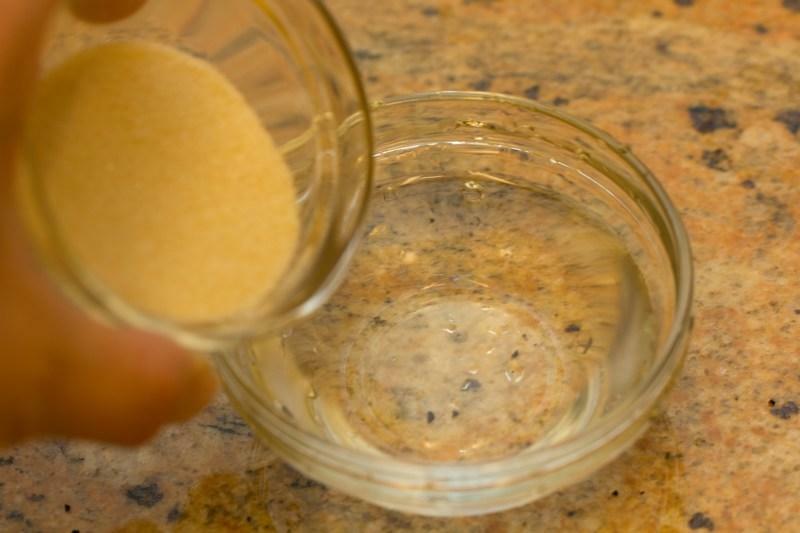 In a small saucepan, combine sugar and water. Caramelize the mixture on medium heat. Shake the pan once in a while but you don’t need to stir with spoon. Patiently wait until it turns into a nice caramelized color. 3. When you see nice (dark) golden caramelized color, immediately pour ½ cup of boiling water because it will quickly get darker and darker (resulting in bitter taste). Make sure to wear a kitchen mitten so you won’t get burnt from the hot liquid splashing. Remove from heat. 4. Quickly soak the ramekins under warm water so sugar doesn’t solidify right away. 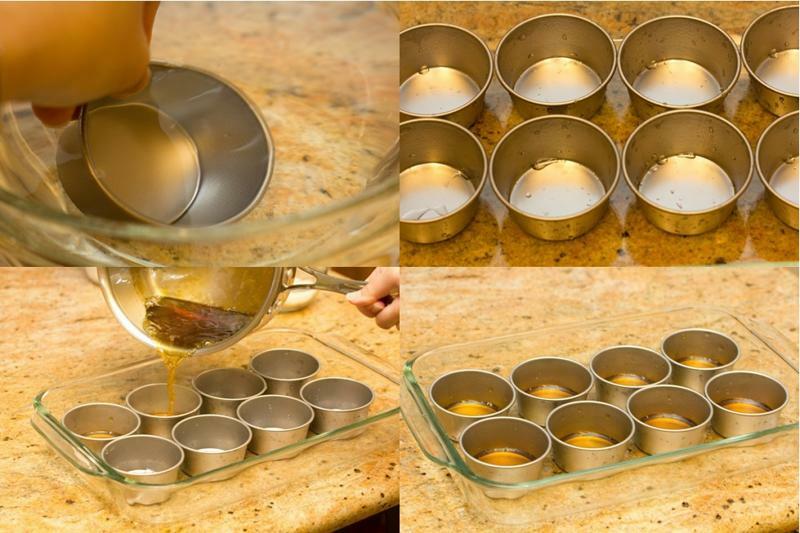 Pour the caramel sauce in the ramekins. 5. In a large bowl, combine egg yolks and sugar and whisk until it becomes creamy and smooth (That’s my husband mixing it up. I asked my husband to be my assistant while I took pictures). 6. 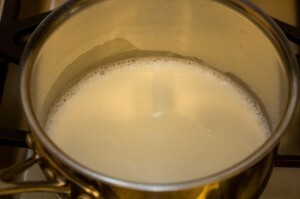 Meanwhile in a small saucepan, bring half of milk (200 ml) to a boil. Remove from heat right before it starts to boil. 7. 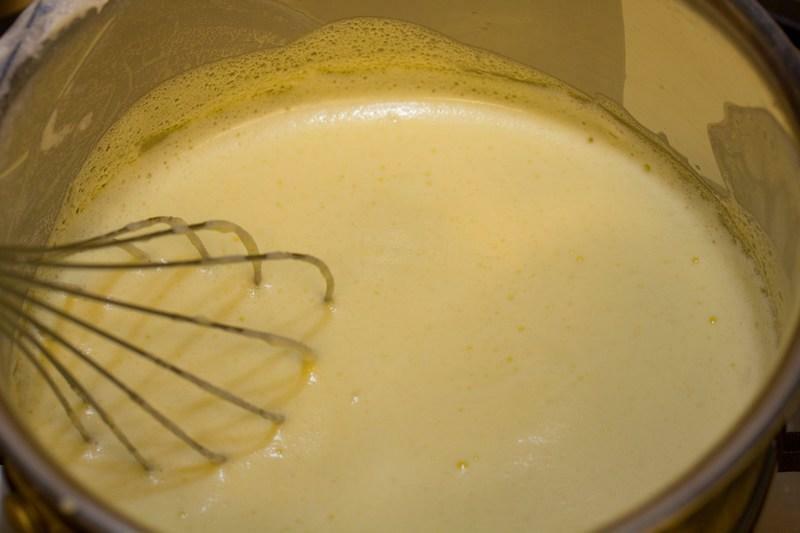 Slowly stir in a few drops of the hot milk at a time into the egg mixture and mix together. 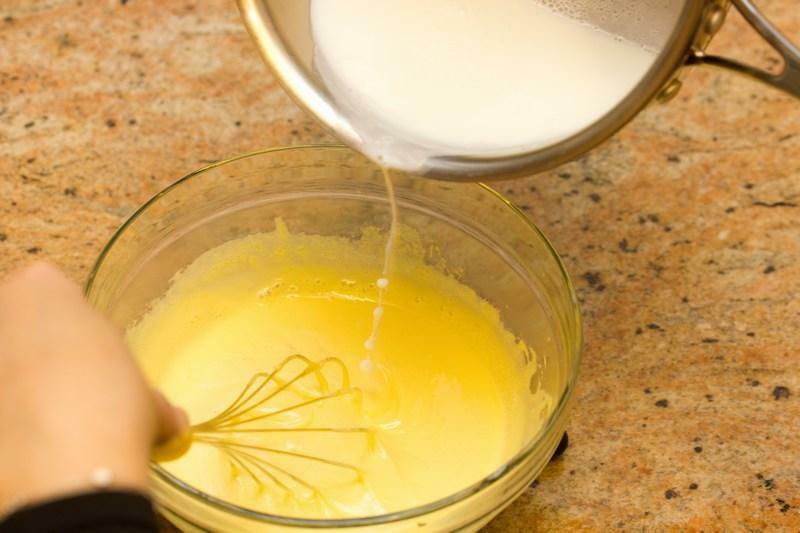 Do not pour milk at once as the hot milk could cook the egg mixture and make it lumpy. 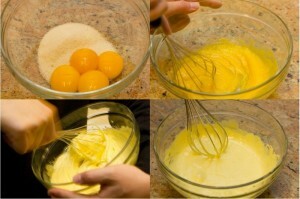 Whisk all together. 8. Pour the mixture back into the small saucepan. Heat the mixture on low heat and whisk until it’s completely blended. 9. Once it gets warm again, add the gelatin and mix. Make sure it melts completely. When the gelatin is completely mixed in, remove from the heat. 10. 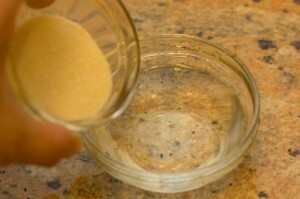 Pour the mixture over the sieve into the clean bowl. 11. Prepare iced water in a larger bowl and place the mixture bowl inside. 12. 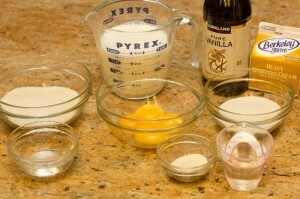 Add the rest of the milk (200 ml), heavy whipping cream, and vanilla. Mix all together well. 13. 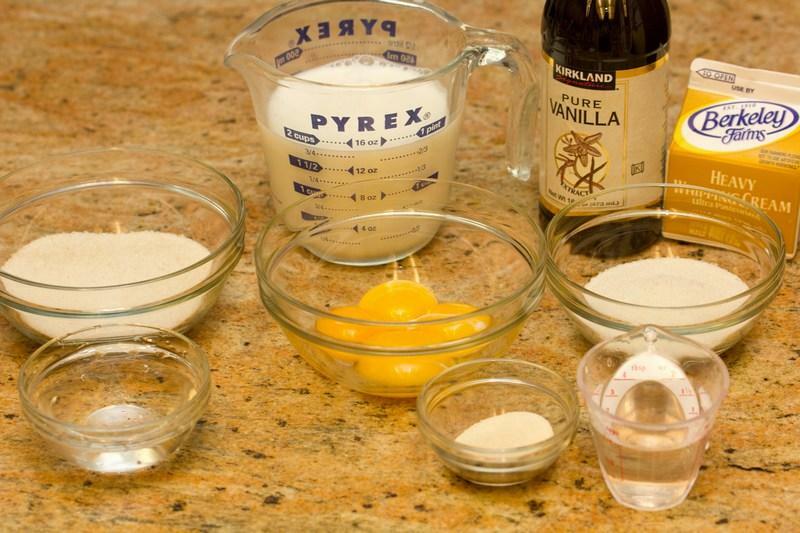 Pour the mixture into the ramekins, and chill in the fridge for more than 1 hour. 14. 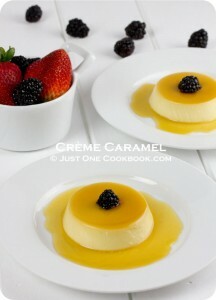 After chilled, insert knife around the Crème Caramel and flip the ramekin on to the serving plate. If it doesn’t come down, hold the ramekin like this (below) and shake once vigorously. You should hear the Crème Caramel drop on the plate. When you caramelize, make sure not to make it really dark, because it will be too bitter. Don’t you just love it? You can imagine what her savoury dishes are like if she doesn’t make desserts that often, my goodness. Nami is also a self confessed “recovering chocoholic”? 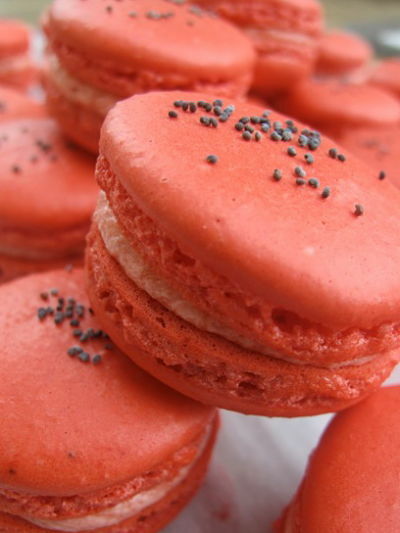 Well, after Nami’s beautiful dessert I think I’ll have to admit that I’m not just a macaronivore but also a crème-carameloholic. 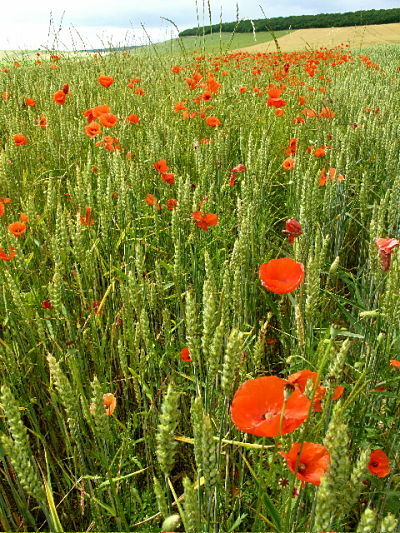 Thank you so much for sharing it with us and these beautiful photos. 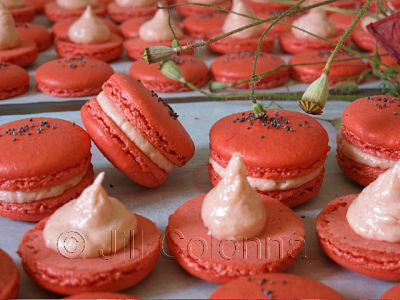 Don’t forget to pop over to Nami’s blog, Just One Cookbook, and say cheers from me! This week she has been making the most outstanding Japanese fish recipes.